On August 2, 2012, a salt dome operated by the petrochemical company Texas Brine collapsed near Bayou Corne, Louisiana, creating a sinkhole that forced the entire town to evacuate. Since then it has expanded to over 26 acres as of 2014, and is estimated to be 750 feet deep. The still-growing sinkhole is showing no signs of stopping and no one knows when it will stop expanding, making it one of the largest ongoing disasters in the US. 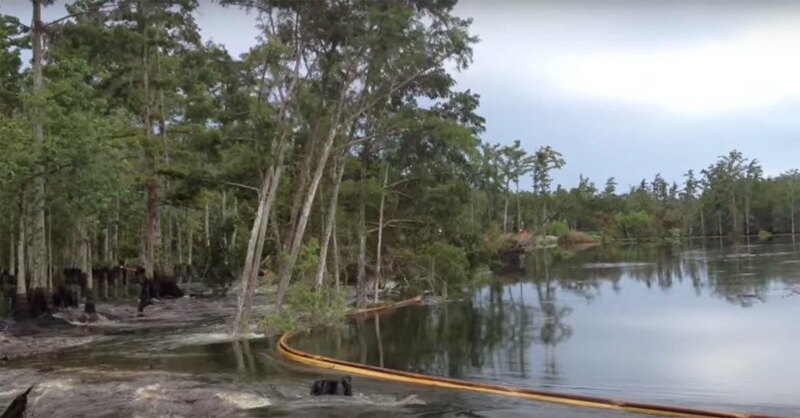 Not only does this monster sinkhole swallow trees, every few weeks it “burps” up between 20-100 barrels of crude oil. It has also unlocked an underground reserve of natural gas, which has seeped beneath nearby houses and could potentially cause dangerous explosions. The sinkhole has gotten so large that it is plainly visible on Google Earth. This isn’t the first time a salt dome has been the site of a man-made disaster. Methane leaks in similar underground caverns have forced residents out of towns in Louisiana and Texas — and in Hutchinson, Kansas, a 2001 cavern leak cause an explosion that killed two people. These aren’t simply tragic accidents, they are the accepted results of modern mining techniques. In 2012, the state of Louisiana filed a lawsuit against Texas Brine for the environmental damage caused by the sinkhole. A federal class-action lawsuit has also been filed against the company by the residents who have been affected by the collapse. For now, Texas Brine has offered to buy out the properties of 92 different households that have been affected — an offer that about half the families have taken up. Most recently, caretakers have been looking for homes for dozens of feral cats left behind when residents were forced to relocate. The lady that feeds all the cats is on facebook you can follow her and even donate The Kajun Kitties Of Bayou Corne Louisiana . She works tirelessly day and night, even through back surgery, she's always there to feed the cats and give what comfort she can. She's trying to find homes for the cats as well as trapping and taking them to the vets for spaying or neutering. oooh humans...how fragile we are.